Twenty-four authors ride with Mercedes Lackey to her magical land of Valdemar, adding their own unique voices to the Heralds, Bards, Healers, and other heroes of this beloved fantasy realm. The Heralds of Valdemar are the kingdom s ancient order of protectors. They are drawn from all across the land, from all walks of life, and at all ages and all are Gifted with abilities beyond those of normal men and women. They are Mindspeakers, FarSeers, Empaths, ForeSeers, Firestarters, FarSpeakers, and more. These inborn talents combined with training as emissaries, spies, judges, diplomats, scouts, counselors, warriors, and more make them indispensable to their monarch and realm. Sought and Chosen by mysterious horse-like Companions, they are bonded for life to these telepathic, enigmatic creatures. 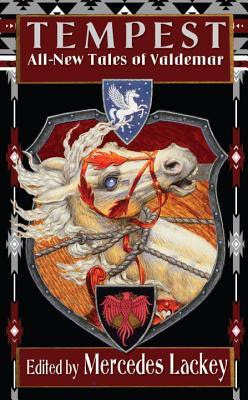 The Heralds of Valdemar and their Companions ride circuit throughout the kingdom, protecting the peace and, when necessary, defending their land and monarch. “A Small Quarrel”: A Herald is on a quest to put down an invasion of Valdemar (and the enemy plan involving Bards is insidious) and he never puts down the invasion. "Girl Without the Gifts": A brave blind girl finds herself aiding a Companion. "Unimagined Consequences": A cozy story about a Lady, a young suitor turned weaver, and a goat with pizzle rot. "Feathers in Flight": A confusing story. A griffon and a changechild deliver a letter. "Blind Leaps": A coming of age in where a female kyree and her human bondmate crave more out of life. "Haver Heartstone": A travelling merchant comes in to charm the town of Haven, and falls afoul of a particular Guard captain. "Unraveling the Truth": A more mature Herald, who is newly Chosen, finds herself going through menopause, and she must use her sense and her keen powers of observation to figure out the truth of a land dispute that is hidden in a series of elaborate tapestries. "Sparrow's Gift": Sparrow is a new mother, visited again by crows with a dire warning, only in this one, the enemy might be much closer than she could possibly imagine. "Harmless as Serpents”: A Companion foal who thinks he is the best of his kind and feels he is ready to find his Chosen, falls to harm, near the Karse border. He will discover his destiny and humility because of this. "The Apprentice and the Stable Master": A daughter of a Healer is summoned by their new master to heal him. When he finds, the girl does a good job, he wants her to heal him further to be able to dance with his intended at a party he is giving. Her mother threatened if she refuses, the girl agrees. "Unexpected Meeting": The assistant is kidnapped by a man accused of stealing from his partner and whom was levelled a hefty fine. "A Trip of Goats": Lena walks goats for the Temple of Thenoth one day and returns to the temple to find a couple with a boy who can mindspeak with animals like her. "The Ones She Couldn't Save": Riann Lives in Karse and has since her mother died, pretended to be a simpleton to avoid being founded out that she has the Gift, as those with the Gift are burned. But one day, she has a vision that shows many dead from some sort of plague or something else, and she has to decided how to save the town. "One Last Night Manning the Home Station": A young woman who wants a Companion to choose her has been taking care of a station near her town. "Only Family Matters": A Healer, with a terrible past flees the Collegium where there is yelling going on back to the circus where he healed a performer. "Medley": Herald Jeris returns to a town where years before he’ been before and had made love with a local girl, Soressa. He discovers Soressa had had his daughter, Cara. Soressa begs him to talk Cara away with him as her father plans to marry the girl when old enough to the same man he originally had Soressa to, until she had gotten pregnant. Cara also has the Gift of singing, making her a potential for the Bardic Collegium. "A Tangle of Truths": Intrigue and politics in this story, which a stuffed bunny of an infant might be poisoned, causing the child to be at risk in the political maneuvering between neighbors, villages, and nations. "An Unwanted Gift": A young man finds he has a Healing gift and doesn’t want it. "Dawn of a New Age": Set in Karse, about two people at the tail end of the reign of the corrupt Sun Priests. "Bloodlines": A tale that is solved with a mediocre speech. It had some interesting twists and turns, but the Herald appears not to dig deep to get to the truth to get actual presentable evidence to guide his actions. "In Name Only": Herald Ryvik is sent by the Queen to settle dispute. His childhood friend, Sves, is in the town. Two tribes meet to seal a peace negotiation, only someone is to sabotage the talks. "Ripples and Cracks": There is a quick summary of the story of the griffin Kelvern from the Owl series, then it goes into his story about his return home. It is the longest story in the anthology, and is written by Lackey and her husband, Larry Dixon. Mercedes Lacey is one of my favorite fantasy authors and I was eager to read this anthology for a review. Some stories were all right, but my favorites entertained me and were great additions to this book, including Mercedes’ own story. Tempest has many stories in it, cozy ones and intriguing ones that will take you into Mercedes Lacey’s Valdemar, with different authors putting their own spins in this fantastic world. Mercedes entered this world on June 24, 1950, in Chicago, had a normal childhood and graduated from Purdue University in 1972. During the late 70’s she worked as an artist’s model and then went into the computer programming field, ending up with American Airlines in Tulsa, Oklahoma. In addition to her fantasy writing, she has written lyrics for and recorded nearly fifty songs for Firebird Arts & Music, a small recording company specializing in science fiction folk music. Great idea for an anthology! I've been a fan of Mercedes Lackey's work for years, and some of those books are still on my Keeper Shelf.